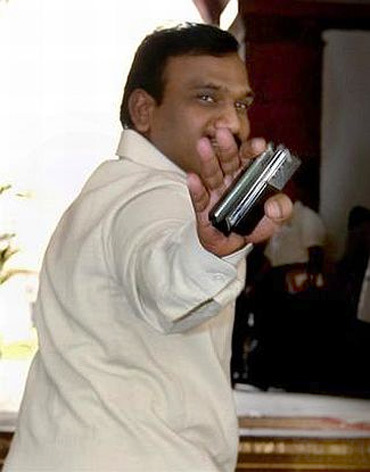 The 2G spectrum scam involving DMK leader A Raja will have an impact on the party's prospects in the forthcoming Tamil Nadu assembly election, feels DMK spokesperson T K S Elangovan. The Dravida Munnetra Kazhagam, the ruling party in Tamil Nadu and a prominent member of the United Progressive Alliance government at the Centre, is going through its worst crisis ever. Many DMK leaders face corruption charges, DMK chief and Tamil Nadu Chief Minister M Karunanidhi's family has been accused of taking over the entertainment industry in the state and the party confronts many allegations of using money power to win elections. In an interview with Rediff.com's Shobha Warrier, DMK Spokesperson T K S Elangovan candidly admits that the All India Anna Dravida Munnetra Kazhagam has a formidable alliance arithmetically at the polls. What is the mood of the party and its cadres after the 2G spectrum scam and the seat sharing fiasco with the Congress? All these things are part and parcel of all elections. Alliance partners will seek more seats and those who allot the seats will try to reduce the number. Finally, there will be a settlement. There is nothing new about it. The last time the Congress contested 48 seats, but they wanted more seats this time. We have given them as many seats as we could. What exactly was the problem between the DMK and the Congress? You even threatened to pull out of the Union government. 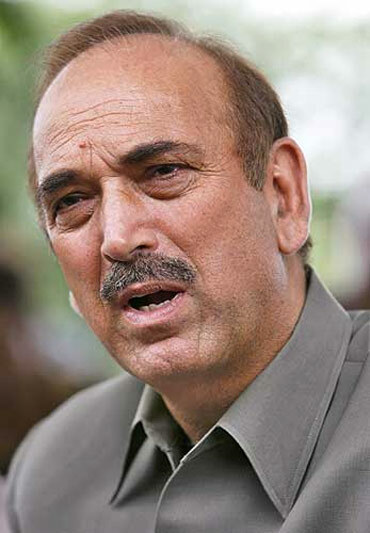 When (Congress leader) Ghulam Nabi Azad came to Chennai to have discussions with our leader (M Karunanidhi), he agreed on a certain number of seats. After he went back to Delhi, the Congress changed its mind. He announced that the Congress leadership wanted a few more seats. Instead of talking to our leader in Chennai, he announced publicly that the Congress would not agree to the number of seats we had offered. This gave our leader the impression that they were not really interested in an alliance with us. No, it was not a question of three seats. We have always accommodated and our leader even now tries to accommodate all our allies. We felt that one or two seats should not be a matter of contention. How much has this incident strained the relationship between the two parties? Whenever there's a clash between the leaders it is the cadres who get agitated and frustrated. When we announced that our ministers were resigning, our cadres were happy! That was the mood of the party then. Your cadres were happy when the DMK decided to withdraw from the UPA government? It is not that our cadres are against the Congress. While the drama was going on -- leaders were coming here, discussing the issue and going back -- the cadres were anxiously waiting outside for a settlement. Our leader kept them posted of what was happening. All these things were playing on their minds. So when we said our ministers were resigning, they were happy because all the uncertainty ended then. After all this, do you think the DMK and the Congress cadres will work together? The DMK cadres will follow whatever instructions are given to them by the leadership. We have people and units working in all the panchayats and villages in the state. There is no doubt that the DMK will work at the grassroots level for the alliance to succeed. 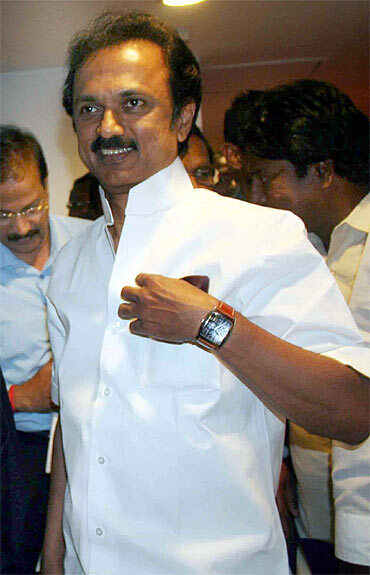 How much will the 2G spectrum scam affect the DMK's prospects? I must answer the question in two parts: Firstly, about the allegations and secondly about the performance of the state government. In the last five years, Kalaignar (as Karunanidhi is referred to by DMK cadres) has done a lot for the state in the fields of industrialisation, employment generation, infrastructure development and social welfare measures. There were no compromises in these areas. You mean because of all these measures, the spectrum scam will not have an impact? It will have an impact. I don't deny that. You must remember that people are not going to elect Raja; that is a different issue. The question is whether people want Kalaignar to continue or not. Has it damaged the DMK's image? This has been projected as the biggest scam the country has ever witnessed, but it is not so. Other political parties are taking advantage of the situation based on the Comptroller and Auditor General's report. The CAG has always been critical of the government. Though it talks about the loss to the exchequer, there is no physical loss, only an estimated loss. Raja has only followed the recommendations of the Telecom Regulatory Authority of India. There was no violation in the allocation. Raja is very confident. He says he is clean. Do you think the scam will have more of an impact in urban areas than rural areas? Those in the urban areas may think about it more. But can they expect a better government from (AIADMK chief J) Jayalalitha than from Kalaignar? Compared to the two tenures (when the state was ruled by the AIADMK and Jayalalitha), there was better rule when the DMK was in power. Both Karunanidhi and (his son and Deputy Chief Minister) M K Stalin are contesting from rural areas and not their Chennai constituencies. Is this because they are scared to face the urban electorate? There is no truth in this allegation. Yes, they are going to contest from different constituencies, but not rural areas. 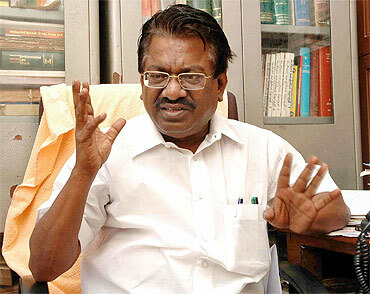 Stalin is contesting from Kolathur, which is in the city. As far as Kalaignar is concerned, Tiruvarur is his birthplace. Till now it was a reserved constituency. When it became an open constituency, he wanted to contest from there since he is sentimental about Tiruvarur. 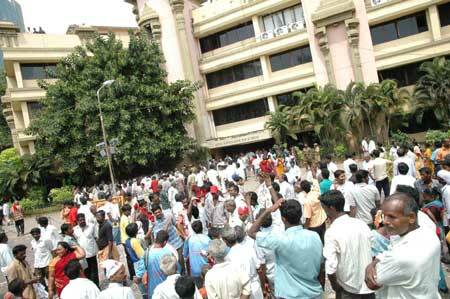 Chennai was the DMK's bastion till recently, but that changed in the last election. Is that why you have allocated a lot of seats in Chennai to the Congress this time? It is true that our support base (in Chennai) has eroded gradually. The last time, we lost seven (assembly) seats. In 1977, after the Emergency, we had won 13 out of 14 seats. The city voters are changing. People from various parts of the state, people with other orientation, come to Chennai. It is a floating population in Chennai now. It is not like the rural areas where people live in one place permanently. Why is the DMK against sharing power at the state level especially when you are sharing power with the Congress at the Centre? We have never said that we are against power sharing. A few years ago, our leader openly said that we are ready to share power if the Congress high command wants that. This time, the impression everyone got was that the Congress wanted a share in the power, but the DMK was against it. We are only at the stage of seat sharing. Power sharing does not come into the picture right now. It's not the time to discuss that. We have never said no to it. Let us discuss the issue after the elections. I don't know how there's an impression that we are against power sharing. 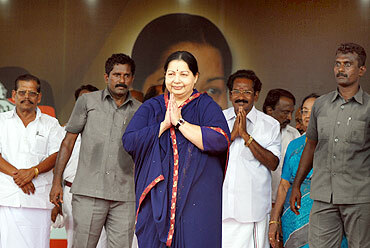 Do you feel Tamil Nadu is moving towards coalition politics? Our idea is that we should have a federal Centre and an autonomous state. Almost all the regional parties should have a share in the running of the Centre. When the Dravidian movement started, it was a movement that included all Dravidians. Today you have parties catering to every caste. There are parties for the Vanniyars, Nadars, Thevars, etc. How do you explain this phenomenon? You see caste-based parties only in Tamil Nadu. We can't say whether this is good or bad, but this is the outcome of the Dravidian movement. Most of these communities, which were backward with no power, have now become empowered. Because of the Dravidian movement, all of them received education and now they also want to be leaders, be a part of the political system and share power. Vijayakanth's DMDK, which received nearly 11 per cent of the vote share in the last elections, has formed an alliance with the AIADMK. Do you feel it is a formidable alliance? Arithmetically, yes. But people know how Jayalalitha has withdrawn several welfare schemes started by Kalaignar. Even the rice given for Re 1 a kg will be withdrawn if she comes to power. All they say is (during the AIADMK's tenure) the law and order situation was good and electricity was available. If there is no industrialisation and growth, there will be surplus electricity. Is it not true that whenever the DMK comes to power, hooliganism increases? It is not true. That is how the media projects it. It is not that hooliganism has come to the fore only during our time. I can quote many incidents of hooliganism when the AIADMK was in power. Hooliganism, rowdism, katta panchayat have always been prevalent. All governments have to take effective steps to control these anti-social activities. Do you feel the DMK failed in controlling hooliganism? No, there was no failure on our part. It is only the projection by the media. Yes, there is an increase in hooliganism, but it is because of issues like urbanisation. It is not a failure on the part of the government. Is it correct for the state government to dole out freebies like colour television sets using the taxpayer's money? Giving freebies is not a new thing in a welfare state. All the countries in the world help the poor in some way or the other. Unemployment doles and old-age pensions are given out across the world. But you are giving colour television sets. That was a novel scheme. It may not be continued in the next term. In the rural areas, people have no access to news and entertainment. That is why we thought of giving them colour TVs so that they are connected to the rest of the world. We distributed the TVs with good intentions and not as freebies. Providing cooking gas was helpful to women in rural areas. We give one egg to every child. It is the TV that was different. We started with the intention of giving it only to the families which do not have a TV, but subsequently we gave one to every household. Will the DMK offer something like this this time? Will price rise have an adverse effect on the DMK's prospects in these elections? Yes, it can have an impact on us. That is why we have taken many measures to control prices. Tamil Nadu can boast of one thing -- we have an universal public distribution system while the rest of the country has a targetted PDS that is only available to families below the poverty line. Does the alliance between the AIADMK and DMDK worry you or make you nervous? No, it doesn't worry us and it doesn't make us nervous either.